LAGOS, April 07, (THEWILL) – The politically instigated text message war in Lagos State has cost a Commissioner in the Lagos State Government his job. Lagos State Commissioner for Housing, Mr. Dele Onabokun was today sacked by the state governor, Mr. Babatunde Raji Fashola, with immediate effect. In a statement, signed by Hakeem Bello, the Senior Special Assistant to Governor Fashola on Media, Mr. Onabokun was asked to handover to the most senior civil servant in the ministry but did not give any reason for his sack. The embattled Commissioner became the second political appointee to be sacked in Lagos State. However, both dismissals are believed to be politically instigated, especially because Mr. Onabokun’s dismissal came in the heat of the SMS war going on in Lagos. The text message has put Governor Fashola on the spot and he is now being accused of masterminding anti-party activities. Although, the governor has vehemently distanced himself from the calumnious messages, the faceless group has not stopped sending them. Another message urged Lagos residents “to vote Labour Party on Saturday to liberate Lagos from Tinubu who imposed his wife, Oluremi; daughter, son-in-law and sister-in-law as candidates. Vote Labour,” and yet another called on the Lagos voters to save the state from alleged Tinubu’s corruption, adding that Fashola was almost impeached for trying to stop Tinubu from allegedly stealing N3billion monthly from the state’s treasury. 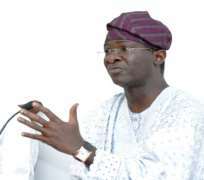 But in a swift denial, a text message purportedly sent by Governor Fashola, under the rubric of BRFGOV, on Wednesday, apparently to clear the air that he was not behind the calumnious text messages, did little to convince some political actors that he was not an accomplice. In his reply, Fashola wrote: “I, Governor Fashola (SAN) reject the impression of me created by the opposition text sponsored messages. I am not a duplicitous person and I stand solidly by my mentor and hero of democracy, Asiwaju Bola Ahmed Tinubu. It was in the midst of this heated electronic war that Mr. Onabokun’s sack was announced. The nature of the sack convinced many political stakeholders in the state that Mr. Onabokun, an indigene of Epe, is another victim of political interference in governance. He was said to be a strong actor in the SMS war against Tinubu and the Action Congress of Nigeria. But luck ran out on him when groups loyal to Lanre Odubote, ACN’s candidate for the House of Representative in Epe, exposed Mr. Onabokun’s clandestine anti-party activities.